TOLEDO, Ohio -- Breweries across the country have been getting ever more creative over the past few years, thinking up quirky beers with unique ingredients. 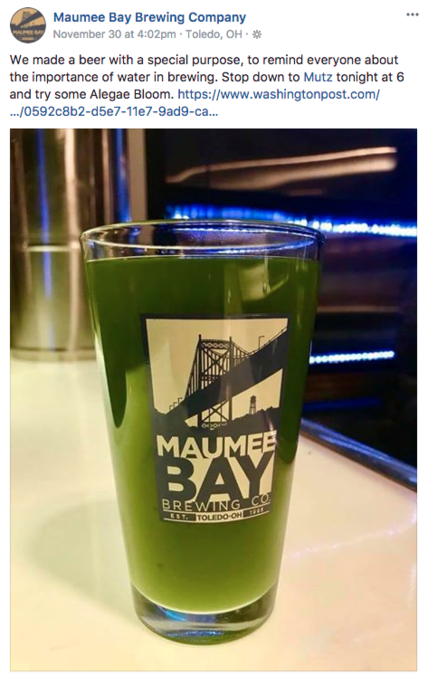 Just last week, Toledo's Maumee Bay Brewing Company unveiled a glowing green brew called "Alegae Blooms" to draw attention to Lake Erie's toxic algae problem that pops up from time to time. It's all in an effort to raise awareness of the city's drinking water woes. Each summer for the past couple years, rainwater washes phosphorus from farms and sewage treatment plants into the lake, feeding harmful algae. It was so bad in 2014 that more than 400,000 people couldn't drink their tap water for two days. "For us, it's important because water is essentially our main ingredient for everything we do," brewer Chris Clarke told The Toledo Blade . "We can't brew beer, can't wash tanks, can't do anything without clean water." Clarke told the paper Alegae Blooms is a sour double IPA, aged on green tea matcha powder and stuffed with tons of fresh kiwi for that eerie green sludge effect. Unfortunately, if you're dying to sample Alegae Blooms, the brewery said it was an experimental batch that only lasted one night on Nov. 30, but they promised to scale up with a larger batch in the near future.